What's the Value of Digital Storytelling? The ToonTastic app is clearly fun, as I described in the previous post. But is there an educational element to this kind of digital storytelling? What do kids learn when they piece together a plot hatched from their own imagination? I asked Andy Russell, the app's co-creator, to tell us more. Andy is a graduate of Learning Design programs at Stanford and Northwestern and has worked for companies like Hasbro and Sony PlayStation to design playful learning experiences for kids. Q. Why do you think story-telling is important in a child's education? As educators, we’re challenged to create new opportunities for kids to become producers of creative ideas and not just consumers – and storytelling is a common and underlying theme in most, if not all, creative work. 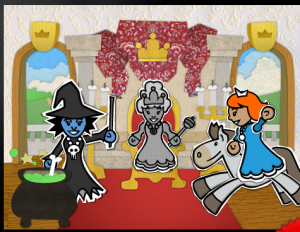 Toontastic enables kids to craft and share their own cartoons, but the core lessons of Character, Setting, Emotion, and Narrative Arc apply to many other mediums from creative writing to filmmaking, music, and art. "My favorite cartoons are those with custom drawn characters and backgrounds and we’ll be doing our best to encourage original artwork through the online community." Our first goal is to help kids become better storytellers. Beyond that, however, we see play as a tool for kids to learn about the world around them. Imaginative play is a social laboratory where kids learn by trying on, testing out, and adapting new ideas just as they might costumes – an experimental theater for practicing the many roles and rules that young children are learning every day. As many parents can attest, it’s not uncommon to see one day’s “real-world” lessons being practiced in the next day’s dress-up session. With that in mind, our ultimate goal is to leverage those stories as lessons themselves – to create a global storytelling network for kids, by kids, where children can share their stories online and learn about the world around them through cartoons made by other kids just like them. Q. How does Toontastic leverage those storytelling skills? Toontastic is a constructionist learning tool that empowers kids to create their own cartoons while introducing and guiding key storytelling concepts along the way. Many Constructionist learning tools like Scratch and Logo enable kids to express themselves through computer programming. 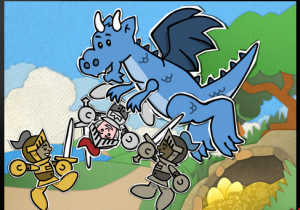 We like to think of Toontastic as Scratch for storytelling – swapping out formal logic for story structure (Characters, Setting, Story Events, and Narrative Arc) – the “code” of storytelling. Q. What were some key features that you had to include for this to be a success for you? Was there anything you wish you could add to the app, but couldn't? I like to think of Toontastic as a springboard for ToonTube, our online storytelling network. There are a lot of storybook and animation tools out there, but very few offer a community space to share your stories and, as a result, they lack the feedback loop necessary to experiment, learn, and as Papert would say, “debug” your ideas. It would have been easy to release V1 of Toontastic as just an iPad app, but we felt that the website and the online network were critical to our learning goals. With that said, the website is still very much a work in progress and we’ll be adding all sorts of new feedback features to the cartoon pages so that kids can critique, review, and offer suggestions about each others’ work. With time, we’ll also be introducing new characters and settings. Given our affection for LEGOs, we started with the basics (pirates and castle) and will be adding more themes as we go. In time, we’re looking forward to branching out beyond the classic genres into abstract characters and perhaps even historical figures. With that said, I must say that my favorite cartoons are those with custom drawn characters and backgrounds and we’ll be doing our best to encourage original artwork through the online community. Q. Is there an adaptive aspect of the app, for those who have mastered certain skills in storytelling to be able to progress to a next level? If not, is it something you've planned? I spent a number of years working in the toy industry where they call great toys “Grow With Me Toys.” I’ll use LEGOs as an example: Kids start at a young age with the basic construction of Duplos, move up over time to more advanced modeling and storytelling with space and pirate playsets before eventually graduating to Mindstorms and computer programming. The basic mechanic of snapping bricks together stays the same, but the play patterns and learning goals evolve over time with the child’s skills and interests. Q. Why is music important in story telling? From a young age, we’re all taught to think of a story as a beginning, a middle, and an end, but a good story is much more than a simple narrative sequence. A good story is a carefully structured series of events that sweeps the viewer through a rollercoaster of emotions. Of course, there are many ways to express those emotions, but Toontastic uses background music to set the mood of each scene. The Music Page blends the work of Robert McKee (USC Film Professor) and Gerrod Parrott (Georgetown Psychology Professor), breaking down the scale of human emotion into 6 core emotions (friendly, happy, surprised, frustrated, sad, and nervous) and three tiers of energy (low, medium, and high). Choosing “Friendly” sets your background music to Gershwin’s Rhapsody in Blue, while bumping the emotional energy up a level to “Loving” changes it to Pachelbel’s Canon. Cranking your scene all the way to High Energy would in turn change the energy to “Passionate” and set your music to a thunderous operatic from Carmen. Though there are many ways to convey emotion and empathy, we’ve found that this template helps to contextualize abstract emotions and provide a discernible structure to kids’ Story Arcs. Toontastic was released this week on the iTunes App Store for $2.99.